Hop Garden stringing competition. 1930s. Photograph from John Topham,s remarkable record of agricultural life in the first half of the 20th C – Topfoto Picture library. Hops are grown in “hop gardens” (Kent and Sussex) or “Hop yards” (Hampshire, Herefordshire and Worcestershire). The “bines” or stems grow up to 20 feet each year on poles. The young shoots were wound around the poles, a process known (in Kent) as “twiddling” From the mid 19th Century the introduction of wire strung to the poles led to a variety of styles of hop growing . 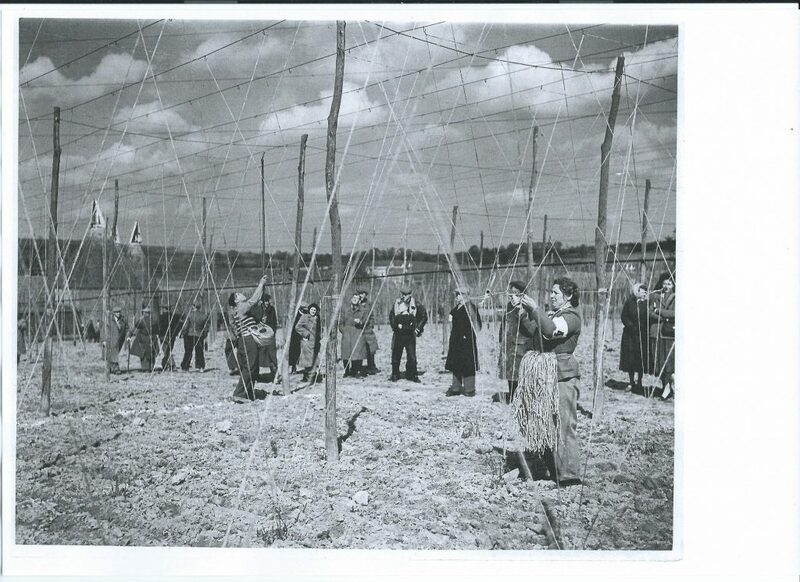 The availability of suitable poles was a requirement for a hop growing region. Poles were a major expense. 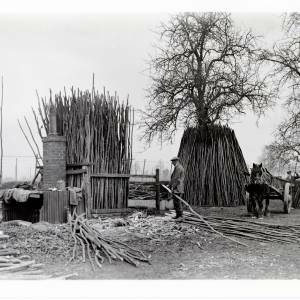 Until creosote was developed in the later 19th Century the poles only lasted a couple of years, requiring 500-800 replacement poles per acre every winter. Workers on long stilts set up the stringing between the poles each spring. The female flowers contain the resins and oils that produce the hop flavour. In September the bines were cut down and picked in the hop garden by hand (until the introduction of mechanised picking). The pickers were managed by a Tallyman and Binman; the number of bushels picked were notched on a piece of wood called a Tally and the pickers given a metal token. 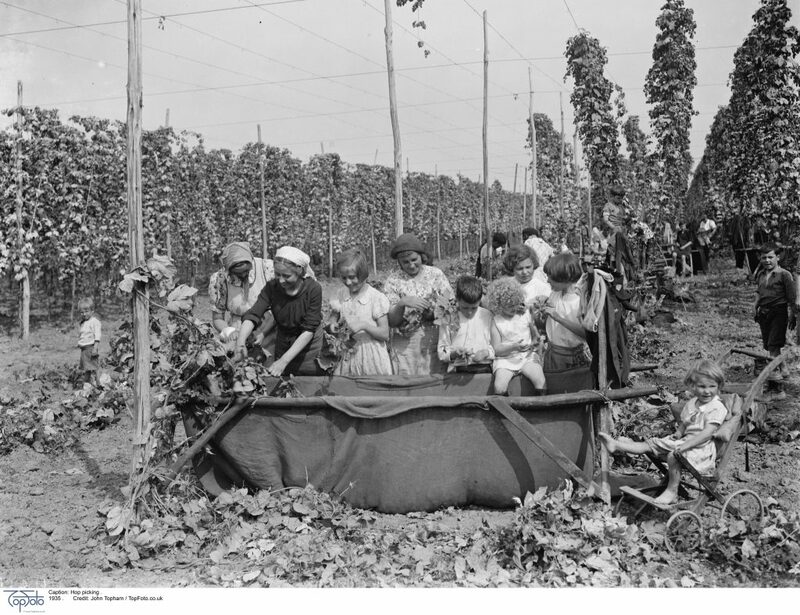 The hops were picked into “bins” or “cribs”, long hessian sacking troughs suspended on a wooden frame. They were measured by bushel weight (approx. 8 gallons or 36 litres) into large, loose jute bags called “pokes” to prevent them crushing or sweating during transfer to the kiln. 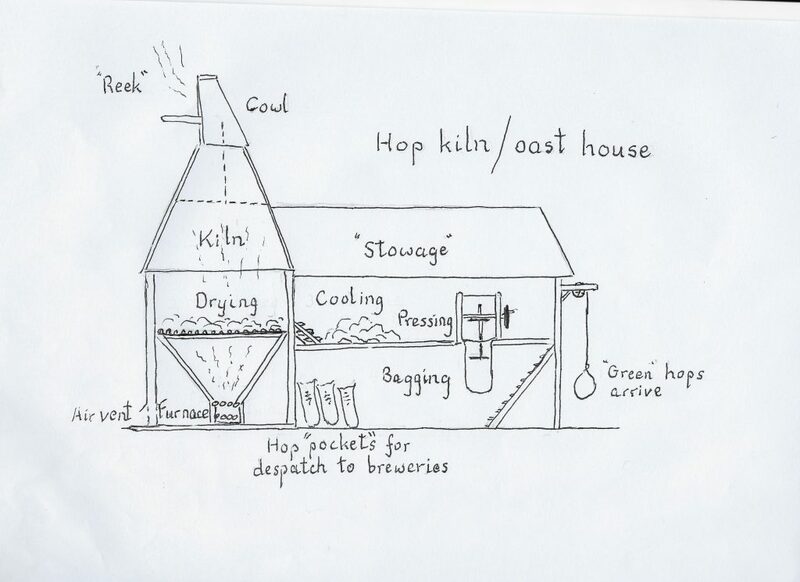 The “green hops” were dried in a hop “oast” (the South East; “wostus” in Kentish dialect) or hop kiln (West Midlands). 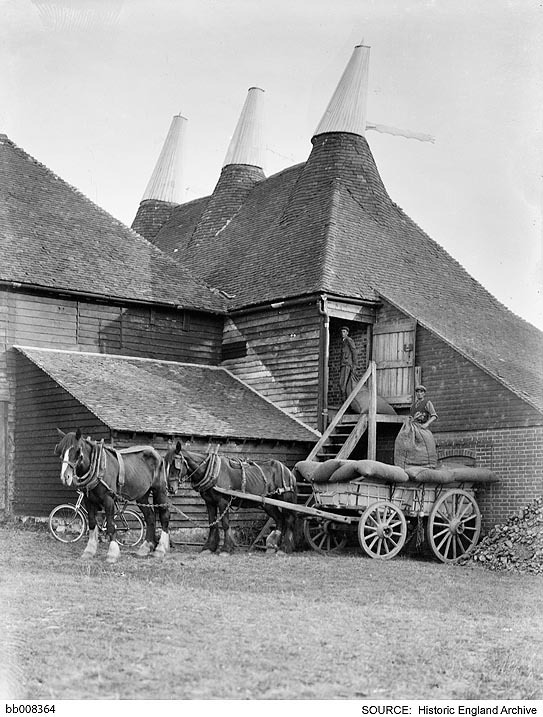 The word “oast” derives from Latin and Flemish words for heat or a hearth. Heat from furnaces on the ground floor rises through a lattice drying platform covered with a horse hair cloth on which the hops are spread for 10-15 hours. Periodically the hops are “hovered up” to aerate them. Air is drawn in through ventilation holes at the foot of the kiln walls. The moisture content of the hops falls from 80% to less than 10% during drying, leaving them brittle and fragile. The inverted funnel shape from the drying floor up to the top of the kiln encourages rising draft, as does the design of the cowl with its back to the wind. 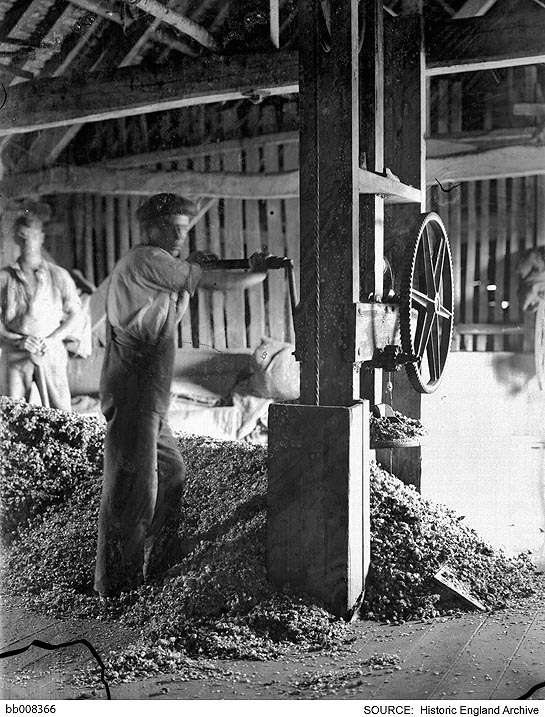 After drying the hops were transferred to a cooling floor in the “Stowage” with large shovels called “scuppets”. Once cool the hops were bagged in long sacks called “pockets” for transport to breweries. The sacks were suspended from a hole on the cooling floor. Until the invention of mechanical presses in the 19th Century a “bagster” climbed into the sack and the hops were tipped in on top of him while he trod them down . He wore flat shoes and a large hat for this dusty and disagreeable task. After pressing the pockets were sown up by hand with long needles leaving ears at the corners for manhandling them. The sowing was known as “coping”. Poles were a major expense. On the left is the heated bath of creosote for treating the poles. 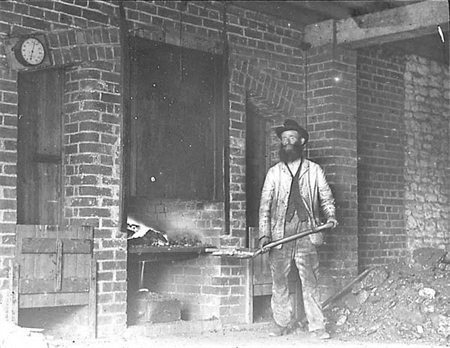 Photo Herefordshire History 1930s. Hop dryng went on continuously in the hop picking season. Picking and drying had to keep pace with each other so that the green hops did not sit around waiting to be loading into the kiln. Drying was a considerable skill, as the price of hops received by the farmer was determined by the quality of colour, smell (flavour) and moisture content. The experienced hop dryer was a respected and valued man. He had to have “skills, sobriety and good morals” according to John Bannister, Synopsis of Husbandry, 1799. He was well paid at 15 shillings per week, though the idea that this could be commuted 10 shillings plus an allowance for strong beer and spirits seems to contradict the advice about sobriety. If the hops were over dried they were described as “fired”; if under dried as “bricky”. The traditional indication that the hops were ready to leave the kiln was that they were brittle and crumbled in the hand when rubbed. Drying was an art not a science, surrounded by much folk law, even after such instruments as thermometers had appeared. The sentiment is clear from the defensive tone of E J Lance’s book (1828): : These details of practice .. are not intended to instruct the old practitioner. but are for the tyro in hop culture. The old practitioners will generally spurn anything taught in a book; and will doubt that anything can be improved on the practice of their forefathers”. Sir Charles Whithead wrote rather patronisingly in 1899 “hop drying is done by ordinary Kentish labourers without any technical teaching or the faintest idea of science of the subject and it is wonderful how well, on the whole, drying has been effected”. Hop growing and drying was a high cost operation for farmers. The lure was high profits, at least some years, though this was unpredictable and fluctuating. The market in hops was highly concentrated in Borough High Street, Southwark, South East London in the hands of Hop Factors, middlemen between the farmers and brewers. Hop growing and drying in Britain expanded more or less continuously from the late 16th Century to reach a peak in the later 19th Century. Thereafter it declined for 100 years and almost disappeared by the late 20th Century. The decline was driven by changing tastes in beers and ales, improved technology in brewing, and imports of cheaper hops, mainly from the USA and Germany. Pressing hops into a pocket suspended below the floor. 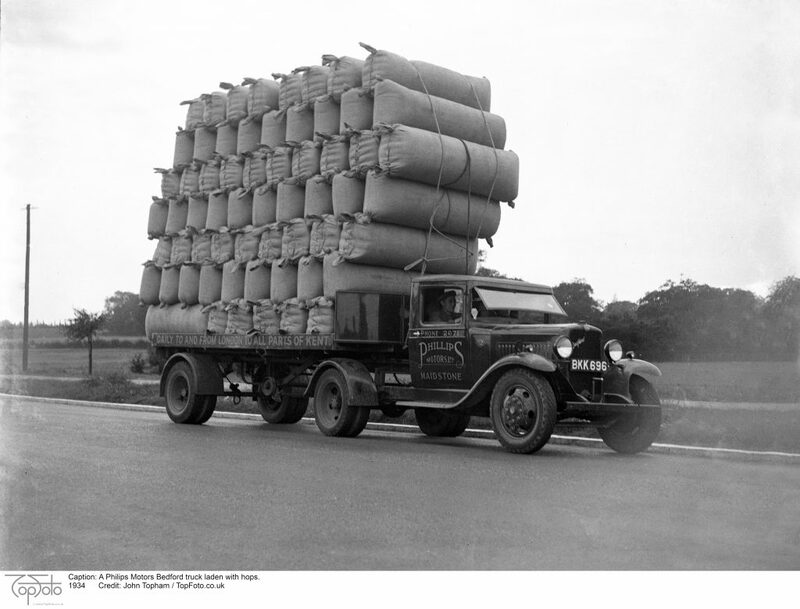 A 1934 photo of Hop Pockets being transported from the growers/dryers to market on a Philip Motors Bedford Truck. They would have fallen foul of today’s road regulations. The quality of the dried hops was all important. Hop factors (traders) and brewers took samples from the Hop Pockets. 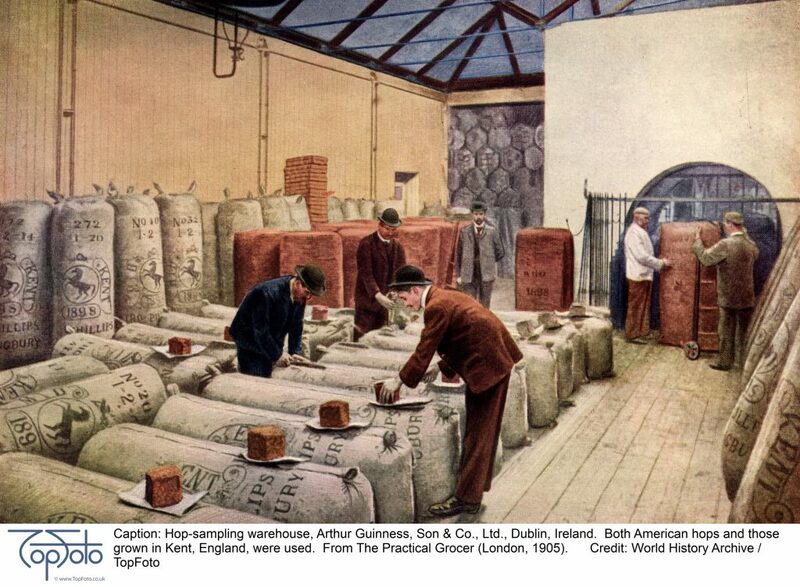 This 1905 photo is from the Guinness warehouse.